Food & Wine How do you buy lamb? How do you cook it? 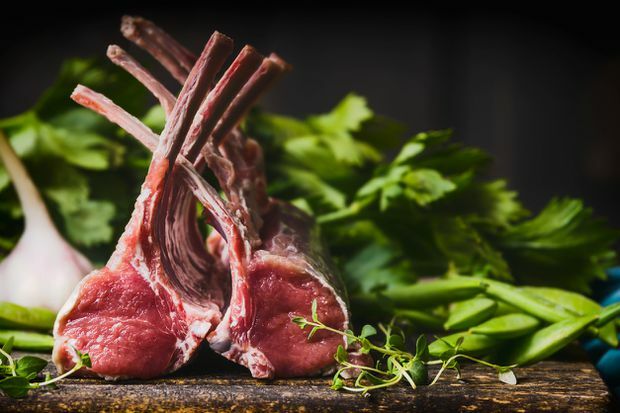 If you looked at restaurant menus you would be convinced that the only cuts of lamb available are racks or shanks. But there are other parts of the animal to consider. Lamb legs are superb roasted or barbecued. For the best flavour and texture, they should be no larger than 2.7 kilograms (6 pounds). To butterfly a lamb leg for the barbecue, remove the bone and slice the leg open, or ask the butcher to do it for you. Grilling takes about 30 minutes, depending on thickness. Lamb rib chops correspond to beef rib steaks. They are tender and can be grilled or sautéed. Look for chops at least 2.5-centimetres (1-inch) thick for the best texture and flavour. A lamb rack is the first eight chops of the rib section in one piece. Lamb racks are roasted whole then sliced into chops for serving. They vary considerably in size depending on the weight of the lamb. Two or three racks tied together in a ring is called a crown roast. Loins chops look similar to tiny porterhouse steaks and are often called lamb T-bones. They are best grilled or sautéed. If the bone is removed and the nugget of meat is tied in a circle, it is called a noisette. Lamb shoulder is fatty, but with excellent flavour and texture. For ease of serving, lamb shoulders can be boned before cooking, otherwise the configuration of bones makes it difficult to carve. Shoulders are either braised or roasted. They can also be cut up into stewing lamb. My favourite method for shoulder: Cook it whole, very slowly for 20 hours, at 170 F. Totally succulent. Lamb shanks are exceptionally tasty. They are braised slowly for a long time in stock to break down the connective tissue. Buy one shank per person. Carving a leg of lamb can be a trial if it has the bone in. Try this method. Holding the leg firmly with the back of a carving fork, slice ¼ to ½-inch slices perpendicular to the bone, starting from the shank or narrow end. Then run your knife parallel to the bone to release the slices. Continue until the top half of the lamb is carved, then turn the leg over and carve the underside. My favourite lamb recipe is a simple braised shoulder that I tasted in Puglia, Italy. It was served for Easter dinner, but is wonderful any time. Have the butcher cut a lamb shoulder into 4-centimetre (1½-inch) pieces. Season well and then brown in 2 tbsp olive oil. Reserve lamb. Add 3 ounces chopped pancetta to pan and cook a few minutes, then add 1 large chopped onion and sauté until softened. Add a couple of crushed garlic cloves. Stir in 1 cup white wine and 1 dried chili. Bring to boil then return lamb to pan. Cover and bake at 300 F until lamb is tender, about 2 hours. Add 2 cups peas, ½ cup chopped Italian parsley and bake another 15 minutes. Refrigerate until needed (up to 3 days) then reheat on top of stove. Beat together 3 eggs and ½ cup grated Parmesan and stir into sauce to thicken. Do not boil, it will curdle. Season to taste and add some grated lemon zest. Serve with roast potatoes or orecchiette.